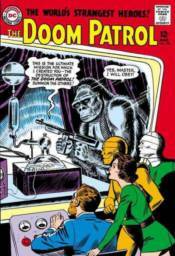 The complete Silver Age adventures of the Doom Patrol, comics' strangest super-team, is collected in a single hardcover! Led by their wheelchair-bound chief, Niles Calder, three outcasts of society-Negative Man, Elasti-Girl and Robotman-take the qualities that made them freaks to become heroes. Together, the trio takes on bizarre menaces including General Immortus, The Animal-Vegetable-Mineral Man and The Brotherhood of Evil! Collects MY GREATEST ADVENTURE #80-85 and DOOM PATROL #86-124.